If some one is annoying you by continuously sending text sms messages,then no need to worry because android offers you various ways with the help of them you can block text sms messages in android.The contact sms text messages will be automatically blocked. 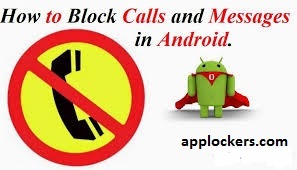 This method of blocking text sms messaging in android phone is for stock sms and for android having version 5.If you are using some other application for messaging,then you can follow the Method#2. Go to Messaging option in android phone. Select (Menu icon) that is present at the upper left corner of your android text sms messages application. Now click on Blacklist option. Select blacklist option to "ON" and then click on "+" icon in order to add a contact to blacklist of which you want to block text sms messages in android. Type the numbers you wish to block.Then you will be awarded with option of blocking text sms messages or blocking calls. In this way,you will be able to block text sms messages in android phone using simple/easy and effective way.If you want to remove the blacklist contact,then you will have to select "Delete"option in order to delete blacklisted number in android. In case your android text sms messages phone is not offering blacklist option,then you can go through the alternate way given below.This method is by using an app to block text sms messages called handcent. For blocking text sms messages,download Handcent Sms android app for your android phone. After downloading Handcent Sms android app,first thing you will have to do is to turn off/disable the notifications of your current text sms messages android app.If you did not disable then you will receive each and every notification two times. Now open the handcent sms app and in the upper left corner,Select Menu Button,then click on the Gear button present at the lower left corner of the screen. Now click Security and Privacy and then click on Manage Blacklist. Click on "+" mark in order to add the phone number which you want to block text sms messages in android phone.You can select that number from contacts or call log too or you can manually enter that number too. The number/contact will automatically be blocked once you have entered his number.You can remove his number too from blacklist by going through Delete button.